Trimble's Resolution® T GPS Timing Receiver is a significant new development in GPS architecture: the general purpose, DSP-based software GPS timing receiver. 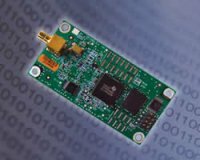 The receiver is a full-featured, all-in-view, 12-channel, parallel tracking, embeddable GPS receiver designed to provide precise GPS or UTC time and synchronization for many static timing applications. The timing accuracy will provide for your current needs with plenty of headroom for future requirements. This low-cost, yet highly accurate and reliable receiver allows the system integrator to put precise timing and synchronization into locations where cost or size is a limitation. Rather than sharing time from a single timing source, with the resultant delays and loss of accuracy, you now can have precise time (synchronization) at every location regardless of how isolated or remote.